Opinion: A Silver Arrow through Brawn’s heart? It’s barely been two weeks since the F1 season drew to a close with a mostly unexciting race in the opulence of Abu Dhabi that gave little indication of the thrilling eight months that preceded it. Last weekend we fans suffered our first real withdrawal symptoms as we coped with our second of nineteen race-less Sundays. We were, however, able to speculate on Jenson Button’s future with many people seeing his visit last Friday to McLaren as a stunt by his manager to try to coax more money out of Brawn. This week, however, both Button and Brawn have hardly been out of the headlines. First up on Monday was the announcement on Monday that a majority share in the Brawn team was being bought by Mercedes and Abu Dhabi investment company Aabar Investments. This was hardly a surprise as it’s been rumoured since the summer. More of a shock was the BBC’s report that Jenson was going to go to McLaren and that the new Mercedes team would have an all-German line-up, most likely of Nico Rosberg and Nick Heidfeld. The sale to Mercedes is welcome in that it provides as much financial security as a team can hope for in the current economic climate. Aabar measures its profits in billions and Mercedes has had a solid presence in Formula One through their partnership with McLaren for nigh on 15 years. Ross Brawn can go back to being team principal and doing what he’s best at – managing the production of championship-winning cars. He didn’t seek out the role of team owner and I suspect he’ll be glad to relinquish that responsibility. The incomparable combination of Schumi and Ross Brawn continued at Ferrari, with the German winning his eighth world title in 2007 after a remarkable season-long battle with rookie Lewis Hamilton. He announced that the 2008 season would be his last but drove brilliantly as he strove to retain his title, only to have it wrested from him by Hamilton at the last corner of the last race. Ross Brawn spent the 2009 season on sabbatical, fishing his way around the globe. When Honda announced its pull-out from F1 in December 2008 amid global economic meltdown, nobody wanted to buy the team. Its lamentably poor car had performed dismally and nobody had seen the potential for a new-style diffuser that the 2009 regulations offered. The team management therefore didn’t have the promise of a car that would outclass the rest of the field for at least the first part of the season. Nor could they offer a team principal who had been the driving force behind seven world championships. To cut a long story short, a buyer could not be found, Honda were not interested in continuing investment and the factory closed in March 2009, making all its employees redundant. Back in the real world, even with Ross Brawn aboard, the team came within two tenths of oblivion. I think it was the potential for a car designed with Brawn’s talent for extracting the maximum possible advantage from the regulations that proved crucial. For that reason alone, I would have liked to see his name preserved in the team. 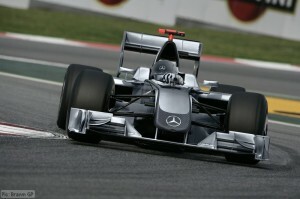 To all intents and purposes, though, the heart of the Brawn team beats inside the cool silver exterior of Mercedes GP. Ross Brawn and the rest of the senior managers will stay in place and it would be a very silly Norbert Haug who tries to argue with him on anything technical. It remains to be seen, though, whether long-serving and experienced engineers like Andrew Shovlin, Jock Clear and Peter Bonington will remain with the team or whether they will follow their drivers to pastures new. How well the new team does in 2010 depends partly on how it adjusts to a completely new pair of drivers. Rubens Barrichello’s departure for Williams to make way for Nico Rosberg had been the subject of rumour since the summer. I remain extremely unimpressed with this. I think that Jenson owes some of his pole positions and victories to Rubens’ help in setting up the car. Had Rubens stayed, I’m sure he would have passed on his valuable experience to Nico. Letting Rubens go may turn out to be a bit of a rare howler by Brawn. I certainly was taken by surprise by the more recent speculation and subsequent announcement today about Jenson going to McLaren. I had not been taken with the manner in which he had conducted his contract negotiations. I doubt I was alone in thinking that he’d moan on for a bit and eventually sign again with Brawn. I find his decision to go to McLaren inexplicable. He said today that he’d always been a fan of the Woking outfit. I guess he’d have to be, taking a salary rumoured to be not much more than half that given to Lewis Hamilton. If part of the motivation for his move is an almighty huff that Ross Brawn didn’t throw the weight of the team behind him to win the championship and knock Rubens’ chances on the head sooner, then it seems weird to go to a team where he’ll be expected to join the orbit around Hamilton. Both Brits on Pole’s LJH and Andrew Benson at the BBC have pointed out that Hamilton and Button need completely opposite things from a car. It’s clear to me that Jenson’s style is better suited to a Brawn-designed car. Jackie Stewart also thinks he’s made a huge mistake. Ross Brawn, prior to the announcement, said it would be a mistake, but you could argue that he would say that, wouldn’t he? I hope I’m wrong – he might thrive at McLaren, but his decision has the air of giving up his birthright for a mess of potage about it. He’s not always made the cleverest career decisions, if you think about it, and it’s a rare reality that lives up to the dream that inspired it. I rather think that the McLaren team is enjoying the chance to stick two fingers up at Brawn/Mercedes. Why else would it have made the announcement at the very moment Jenson was visiting the Brawn factory to meet the staff and sign autographs for them? I know that if I want people to be polite, I should watch cricket or bowls or something, but I think it was unnecessarily rude. At least I can be assured that my team has a reasonably secure future so, in that respect, it’s a good deal struck by Nick Fry and Ross Brawn. It’s not as though they’ve let just anyone buy the team – the new owners have a credible history in the sport and the jobs of 450 people are secure. Over at Mercedes’ former team, though, the dynamic between Lewis and Jenson will be watched with interest. I confidently expect that the season opener in Bahrain won’t be the first – or last – time we’ll hear reports of rows between them. Whether these reports are accurate, only time will tell. Author: Caron Lindsay. Wrote for Brits on Pole on the subject of Brawn GP and its championship campaign during the 2009 racing season. Caron has written 3 articles for us. I think there is another element in Jenson’s decision. That element being Sebastian Vettel. He has a contract with Red Bull to the end of 2012 but I don’t think it takes much thought as to what Mercedes will be thinking. Its quite possible that Vettel will be bought out of his contract from Red Bull by Mercedes and be installed in their team for 2011. That thought could possibly have gone through Jenson’s thought process while he was considering whether to stay with Brawn or take the McLaren seat. I also consider that as Jenson has said on more than one occasion he needed another challenge in his life now he had clinched the World Drivers title and what more of a challenge that to go head to head in the same car with possibly the fastest driver on the grid. McLaren have also demonstrated immediately after gaining independence from Mercedes that they can employ the driver line-up they want without having to play to someone else’s tune. I consider Jenson’s move to McLaren will bring a fantastic dimension to next season. Categorised under F1, Opinion, tagged under Brawn GP, Jenson Button, Lewis Hamilton, McLaren, Ross Brawn.